Take a step back in time to days when discos, pompadours, and vinyl records were all the rage. Click here to play! It's the Vinyl Countdown and there is plenty of cash to be won! 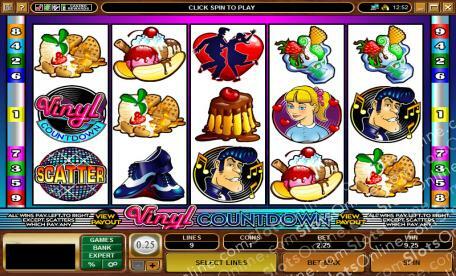 Vinyl Countdown is a retro 5-reel slot played across 9 lines of musical madness, with the more lines activated allowing larger payout odds on winning hands. The Disco Ball is Scattered and can payout up to 100 times your initial wager, as well as multiplying your payouts. The Jukebox is Wild and can be substituted for any other symbol except Scatters, while the Vinyl Countdown symbol pays out up to 1000 times your original bet. There are 9 symbols that can pay out at exorbitant amounts whenever you spin up three or more of them in one go, so take yourself down to the Vinyl Countdown for some incredible cash winnings today! The Disco Ball is Scattered and can pay out up to 100 times your bet, as well as multiplying your payout odds. The Jukebox is Wild and can be substituted for any other symbol on the reels except Scatters.